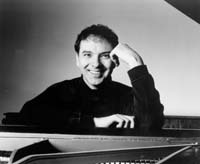 Pianist Stéphane Lemelin's versatility enables him to be as much at ease in a concerto as in a chamber quintet. His enormous repertoire covers almost all periods of classical music. Ravel is the composer that seems to move him the most, but his many recordings include works by Schubert, Schumann, Fauré (he has recorded the rarely performed Nocturnes on the CBC label), and forgotten composers such as the French impressionist Gustave Samazeuilh and Guy Ropartz (a CD of the latter's piano works will be issued in the winter of 2002). Lemelin is a tireless worker. He feels the need to spend five or six hours a day on his repertoire, both at the piano and away from it, analyzing the works. “You've got to live with the work in order to know what its possibilities are,” he says.